Yum. A dark chocolate cupcake recipe with vanilla buttercream frosting is the right way to your sweetie’s heart. 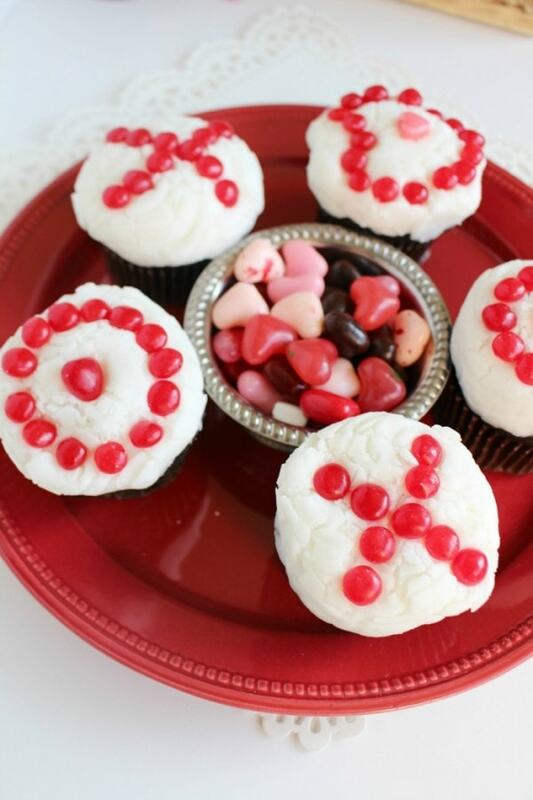 Decorate the cupcakes with cute X’s and O’s to make an adorable Valentine’s Day treat. This recipe will yield 2 dozen regular size cupcakes. 1. Preheat oven to 350 degrees. Grease and line cupcake pans with paper liners. 2. In a large mixing bowl, cream together the sugar, butter, and eggs until a light and fluffy consistency. 3. Add the baking powder, salt, and cocoa and cream together until smooth. 4. Add 1/3 of the flour and stir until well combined. Add 1/2 of the milk and blend well. 6. Add the remaining 1/3 of the flour and stir until combined. 7. Pour cupcake batter into greased and lined pans. 8. Bake at 350 degrees for 22-25 minutes or until an inserted toothpick comes out clean. 9. Allow cupcakes to cool in their pans for 10 minutes. 10. Transfer cupcakes to wire rack for at least 30 minutes to complete cooling process. 1. In a mixing bowl, cream the butter. 2. Add half of the sugar and mix well on medium speed with a mixer. 3. Add the rest of the sugar and mix on medium speed until light and fluffy. 4. TIP – to thin icing, add 1 T milk and to thicken icing, add 1 T powdered sugar. 5. 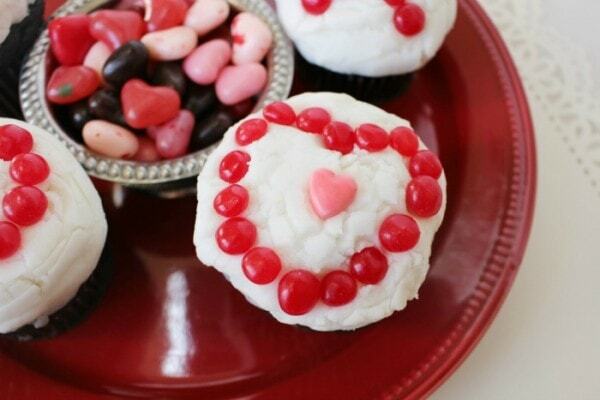 Using a decorating tip and disposable bag or Ziploc bag, pipe the frosting onto each cupcake. 6. 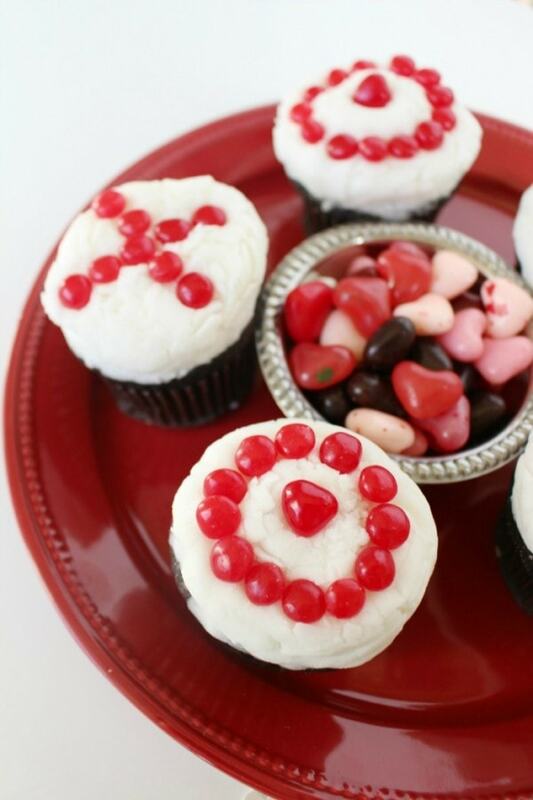 Garnish with red hot candies in the shape of X’s, O’s and hearts. Use a few candy hearts to place in the middle of the hearts but this is optional. Who will you make this dark chocolate cupcake recipe for this Valentine’s Day? 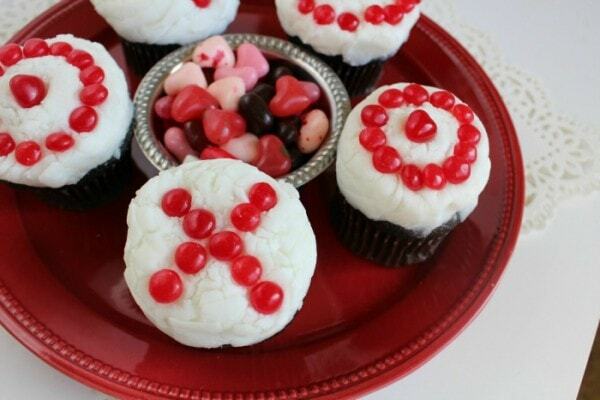 Your dark chocolate cupcakes look delicious and decorated so cute for Valentine’s day! Happy Valentine’s Day! These look so cute. Like the buttercream frosting. I love dark chocolate and these sound delicious! Thanks for sharing at Merry Monday. I like that you made these dark chocolate. They look divine! Awwww, these are adorable! These would be cute to play tick tack toe with as well! That’s if you were wanting to play a messy tick tack toe! haha Thanks for linking up with delicious dishes recipe party! These are so cute and sound so good! I will bake them for my hubby and sons.